Want to get the inside scoop on how to host a successful gala in Texas - and beyond? 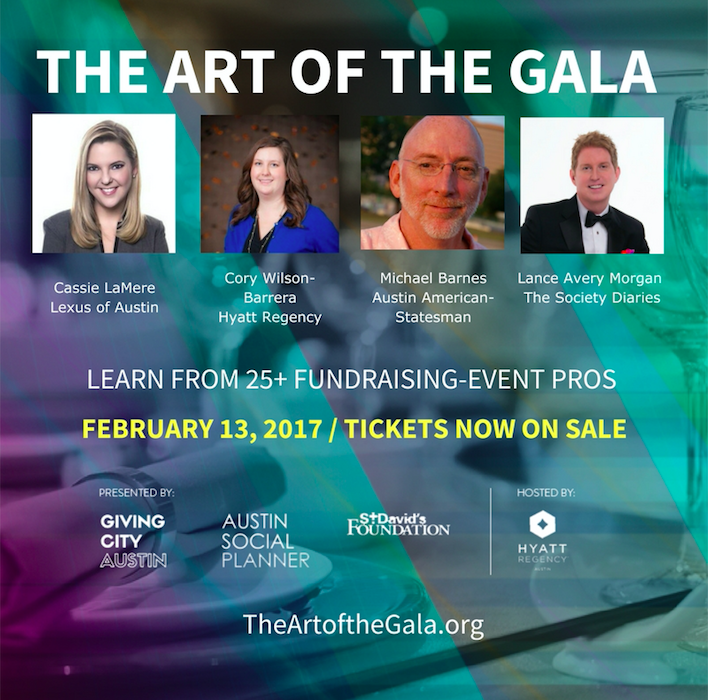 Look no further than The Art Of The Gala conference in Austin on Mon, Feb. 13. The brainchild of Monica Maldonado Williams, the gathering is predicted to be a huge success. She’s teamed with St. David’s Foundation, Hyatt Regency and Austin Social Planner. You may just see a familiar face like our very own Lance Avery Morgan who will serve on the panel, Lexus of Austin’s Cassie LaMere, Michael Barnes of the Austin American Statesman as well as our Senior Social Editor Rob Giardinelli. Austin Social Planners’ Kevin Smothers and Laura Villagran-Johnson who are among those who will helm breakout sessions as well. Informing, enlightening and entertaining conversations are expected…and welcome. Join us, won’t you?